Who doesn’t love cute bunnies? Seriously, does anyone ever think, I have no interest in adorable bunnies? 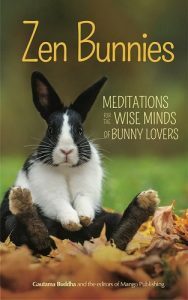 Since one of my favorite things to do online is look at cute animals, when I was offered a chance to check out “Zen Bunnies: Meditations for the Wise Minds of Bunny Lovers” I was all in. Talk about truth in advertising, it is a whole book of photos of little bunnies paired with assorted Buddhist and mindfulness type quotes. The author credit on the cover is “Gautama Buddha and the editors of Mango Publishing”. Is this a scholarly work for practitioners of Buddhism? No. But is it the perfect gift for any occasion? Absolutely. 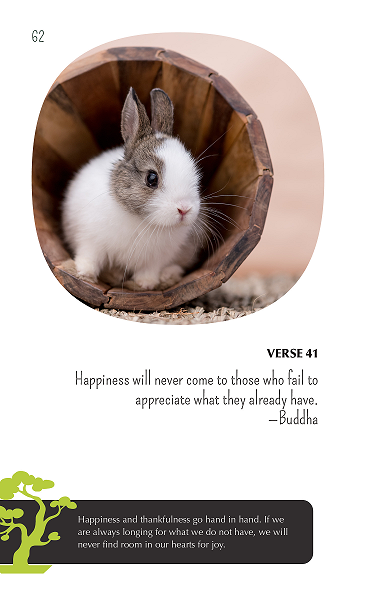 The combination of cute bunnies and thoughtful quotes make it an excellent gift for just about anyone, for any reason. Perhaps even for yourself to enjoy. To learn more about “Zen Bunnies”, visit here. Good news! Mango Publishing was nice enough to provide a copy of “Zen Bunnies” to give away to one lucky reader! I’m using my usual Rafflecopter option, so see how to enter below. Contest ends Saturday, Sept. 29th at 11:59 PM eastern. No social media platforms are sponsoring this contest.